The food security bill has been passed. But implementing it is a formidable challenge. "It is time to send out a big message that India can take the responsibility of ensuring food security for all its citizens," said Congress president Sonia Gandhi, as she pushed for the passage of the National Food Security Bill in the Lok Sabha at the end of August. The bill, since passed by both houses of Parliament, makes cheap foodgrain a legal right for 67 per cent of India's 1.2 billion people. But implementing it may not be easy. Critics say the bill is a hurried piece of legislation that rests on an already crumbling programme, the Public Distribution System (PDS), which has failed to provide food security, despite being in place for five decades. They maintain it is a populist move aimed primarily at grabbing votes in the next general election due in May 2014. The bill is vague on how the new food scheme will overcome the massive corruption plaguing the existing system. Critics also question how the government will identify the beneficiaries. "Who are the poor? 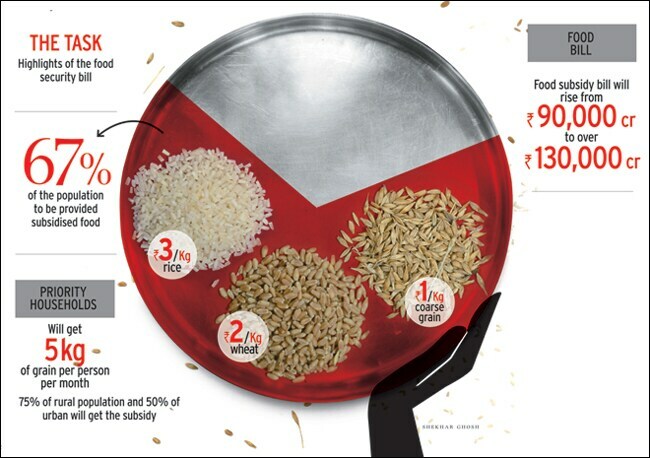 Does anyone know how to identify who deserves food subsidy and who doesn't," says Bharat Ramaswami, Professor, Planning Unit, Indian Statistical Institute. "Some 90 per cent of our workforce is in the unorganised sector. There is a better chance of inclusion with 67 per cent coverage, but we don't have the technology for it." Plugging the existing leakages is an even more formidable task. Under the PDS, a network of fair price shops sells subsidised grain at around five to seven rupees a kg to nearly 45 per cent of the population. However, studies have shown that only about half the allocated foodgrain actually reaches those it is intended for. The bill extends that programme to 67 per cent - or nearly 800 million people - and provides the grain at even cheaper rates. "We are just muddling through," says Ashok Gulati, Chairman of the Commission for Agriculture Costs and Prices. Food has been a contentious political issue in India for decades. It has always been at the core of various central and state government-run welfare schemes - apart from the PDS, former Prime Minister Indira Gandhi thrived on her promise to provide Roti, Kapda aur Makaan (food, clothing and shelter) in the 1970s while the Antyodaya Anna Yojana was launched in December 2000 to provide 35 kg of grain a month to the poorest of the poor households. There have also been judicial interventions. In 2011, the Supreme Court directed the Centre to release five million tonnes of foodgrains for distribution in 150 poverty-stricken districts and other poorer segments. Earlier, a 2009 report by the Justice Wadhwa Committee constituted by the Supreme Court recommended the adoption of modern technology such as smart cards, and said collusion between fair price shop dealers, transporters and politicians was responsible for the leakages. But there has never been a serious effort to reform the system. India was still ranked a low number 15 on the Global Hunger Index in 2011. Some analysts say technology could reduce the leakages. One suggested way out is to link the scheme to the Aadhaar network, but even that is still lumbering along because of delays related to politics. In October 2011, the Nandan Nilekani-led Unique Identification Authority of India (UIDAI) submitted a report to the food ministry on an information technology strategy for the PDS which recommended setting up a dedicated PDS network (or PDSN) as a national information utility company with a CEO and shareholders to operate the scheme's IT infrastructure. The bill does suggest computerisation as a way to plug the leakages and proposes leveraging the Aadhaar data base to identify prospective beneficaries. It also proposes full transparency of records, the introduction of cash transfers and diversification of commodities. "Aadhaar can be used to remove ghosts and duplicates in the PDS. It can also be used for online authentication so that the beneficiaries can take their allocated quota of grain," says Nilekani, Chairman, UIDAI. "There is a realisation that for the benefits to be delivered, the whole thing, including the supply chain and technology needs to be toned up." But the bill does not spell out a time-frame in which to achieve these objectives. Gulati says it will be take about two years for the Aadhaar network to be completely ready. He believes the new scheme cannot be implemented in the next six months to a year because several contentious issues such as cost-sharing between the centre and states, as well as identification of beneficiaries have still to be resolved. He sums up the other hurdles. "The cost will increase. 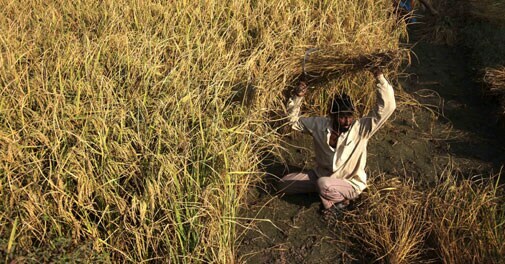 The present rate at which wheat and rice are being given (under the PDS) hovers between five and seven rupees a kg. This will come down to two or three rupees per kg. We don't have proper storage capacity. We don't have enough capacity to transport it. Food keeps lying in the fields for years. At present the need will be 62 to 63 million tonnes of grain. What will happen in a drought year? In 2002-2003, foodgrain production dropped by 38 million tonne. Where will you go in such a scenario?" he asks. Cash transfers, as the bill suggests and many experts too concur, may solve some of the problems. But the government is likely to be hobbled by network and broadband issues as well as the fact that nearly 400,000 villages do not have access to banking. Moreover, the cost of assembling a technology framework, which some experts peg at a few thousand crore, outweighs the benefits. And the government can barely afford to fork out any more for a scheme that is already likely to stretch the state exchequer. Food Minister K.V. Thomas says the bill will cost Rs 15,000 crore more than what the government spent on the PDS last year, but some opponents of the scheme claim the real cost could be several times more. But the difficulties may not be insurmountable. The PDS has been successful in some states, such as Chhattisgarh and Tamil Nadu. In Chhattisgarh, about 75 per cent of households receive 35 kg of rice at Rs 1 or Rs 2 a kg. In Tamil Nadu, the scheme is universal and relatively corruption free. "I have been arguing that this is a great opportunity. We should be open minded about how we deliver it. If Madhya Pradesh has food coupons and Bihar wants to do cash transfers - that should be okay too. Let the states benefit. Let's not wear ideological blinkers," says Ramaswami.